This naughty Bloomin' Onion Bread has cheese stuffed in every crack and is cut just like the Bloomin' Onion from Outback. My family loved this but really it's enough to feed a small army. 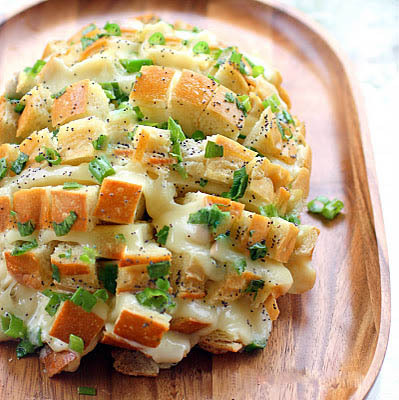 It's a fun way to serve bread because everyone can just pull off a piece of cheesy onion bread. This would be a great appetizer or bread for a meal. Preheat oven to 350(F) degrees. Cut the bread lengthwise and width wise without cutting through the bottom crust. This can be a little tricky going the second way but the bread is very forgiving. Place on a foil-lined baking sheet. Bake at 350(F) degrees for 15 minutes. Unwrap the bread and bake 10 more minutes, or until cheese is melted.